In the early 1970s I started tracing my branch of the Stoner family and over the years collected a quantity of data. In the late 1990s much of it was placed on the website and ten years later this new version has clickable links between births, marriages, deaths, and families. 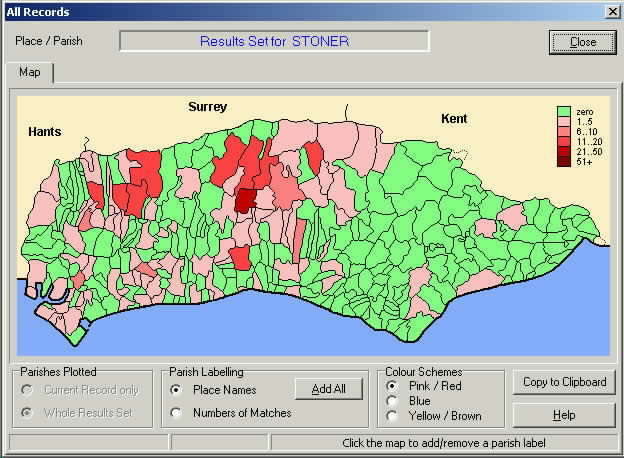 Although not featured in books on Sussex surnames, from the Victorian censuses it was apparent that Stoner is a Sussex name. A rough breakdown was Sussex 50%, 'London' 20%, Yorkshire 10%, and 'the rest' 20%. Mid and west Sussex had the main concentrations, with the Yorkshire Stoners largely in York, Leeds, and Bradford. This illustration taken from the Sussex Marriage Index CD has each parish coloured according to the number of Stoner marriages found between 1538 and 1837. Because some of Sussex is in the RH (Redhill) postcode grouping, the main concentration appears to spread from Sussex into Surrey. The latter county, and to a lesser extent Hampshire, do have their share of Stoners. On the larger stage www.publicprofiler.org/worldnames/ has some interesting tables offering FPM 'frequency per million' values, based on current name databases. The results were listed under Countries, Regions, and Cities. It seems likely that the majority of United States Stoners are descended from German speaking Steiners from around Europe, who changed their surname. Germany's FPM of Steiners is around 350, Switzerland's 1,000, and Austria some 2,500 with one region having 5 Steiners in every 1,000. I found it surprising that New Zealand had the region with most Stoners per million of population. It turned out that the population of the region in 2006 was just over 30,000 meaning about a dozen were named Stoner. But not surprising were the top cities, based on postcodes most of which include Sussex. Transcriptions were made of the Stoner Birth, Marriage, and Death indexes, from the binders - handwritten and typed - over a period at Somerset House, St Catherine's House, and the Family Record Centre. In some cases initials were subsequently expanded in my files to full christian names so you may want to check at www.freebmd.org.uk or elsewhere. Full christian names (and mothers' maiden names) prior to 1911 were later added from the GRO database at https://www.gro.gov.uk/gro/content/certificates/Login.asp as were ages at death prior to 1866. Baptism and marriage entries were transcribed from IGI microfiche in the 1980s. This section needs an update as many more are now available. There's a section of instances where the birth or marriage entry was not found or found elsewhere. Census data. This includes a number of examples of misrecordings and mistranscriptions. An attempt has been made to list 'families', with the marriage and birth records together. The first eight Stoners identified in my line hailed from Sussex; I'm from Surrey. Circumstantial evidence places the Thomas marrying Mary as a son of Robert and Elizabeth. Stoner entries in the Woodmancote parish registers cease with Robert's death and the names of their offspring re-appear at Cowfold. The site is a work-in-progress as I have more data offline. Please let me know of any transcription errors or incorrect links between family members.